Burnley will speak to keeper Paul Robinson about extending his stay at Turf Moor. 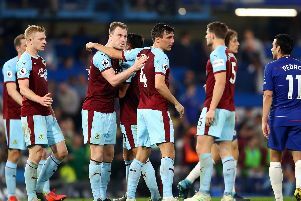 The former England international, now 37, joined the Clarets in January last year, on a deal until the end of the season, having been a free agent since leaving Blackburn Rovers in 2015. He agreed a further year in the summer, and has gone on to make three appearances this season – his first in the Premier League since 2012 – deputising for Tom Heaton after injury against Manchester City and Stoke City, and illness at Swansea City. The former Leeds United and Spurs man has been replaced on the bench by £1m summer signing Nick Pope for the last two games, but boss Sean Dyche explained: “Robbo knew all along, the plan was Popey would start coming into it. “He’s got to get used to all this and experience it. “We wanted him to develop as a keeper, even though he’s not playing a lot of football, but get used to what it is. Robinson’s experience was, however, put to good use on Saturday at Middlesbrough on Saturday: “Robbo was in the stand and came down with some information. “He’s been in the game a long time and understands it. Robinson earned 41 caps for his country, and made made 372 top-flight appearances – keeping 86 clean sheets for Leeds, Blackburn Rovers and Tottenham Hotspur.